Commissioned by The American Association of Physicists in Medicine (AAPM) for their June 2015 Summer School, Proton Therapy: Physical Principles and Practice, this is the first AAPM monograph printed in full color. Proton therapy has been used in radiation therapy for over 70 years, but within the last decade its use in clinics has grown exponentially. 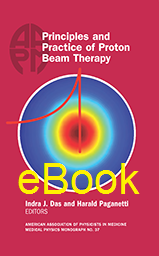 This book fills in the proton therapy gap by focusing on the physics of proton therapy, including beam production, proton interactions, biology, dosimetry, treatment planning, quality assurance, commissioning, motion management, and uncertainties. Chapters are written by the world's leading medical physicists who work at the pioneering proton treatment centers around the globe. They share their understandings after years of experience treating thousands of patients. Case studies involving specific cancer treatments show that there is some art to proton therapy as well as state-of-the-art science. Even though the focus lies on proton therapy, the content provided is also valuable to heavy charged particle therapy. The book is tailored mainly to clinical physicists, who might use this as a textbook in the fast-growing field of proton therapy. Furthermore, this book provides up-to-date references to the scientific literature on each aspect of proton therapy covered in its 28 chapters. The book also includes an appendix of proton therapy nomenclature. Indra J. Das is Professor and Director of Medical Physics in the Department of Radiation Oncology at Indiana University School of Medicine in Indianapolis. He received his MSc degree from Gorakhpur University in India and a diploma in Radiological Physics from Bhabha Atomic Research Center and Bombay University. He earned his MS and PhD degrees from University of Wisconsin and University of Minnesota, respectively. He is a fellow of the Institute of the Physics and Engineering in Medicine and a recipient of the Farrington Daniels award of the AAPM. He has authored and co-authored more than 180 peer-reviewed publications in every aspect of radiation oncology physics, including proton beam. He is an expert in dosimetry and treatment planning. Harald Paganetti is Professor and Director of Physics Research in the Department of Radiation Oncology at Massachusetts General Hospital and Harvard Medical School in Boston. He received his Masters and Ph.D. from the University of Bonn, Germany. He is a member of numerous task groups and committees for the American Association of Physicists in Medicine, the International Organization for Medical Physics, and the NIH National Cancer Institute. He has authored and co-authored more than 150 peer-reviewed publications, the majority being on proton therapy. His main research topics include advanced dose calculation methods and biophysical modeling of radiation effects.